Research in hibernating animals is uncovering connections between metabolism and telomere length, which shortens as we age. Oxidative stress, which has been linked to telomere shortening, also has a lot to do with metabolism — including what we eat and when we eat it. Hibernation periods (and fasting?!) reduce oxidative stress and may preserve telomeres over time. A close-up of a sedated Arctic ground squirrel at Toolik Field Station, Alaska. Photo by Andre Wille (PolarTREC 2014), Courtesy of ARCUS. Carefully holding a hibernating Arctic ground squirrel. University of Alaska Museum of the North, Fairbanks, Alaska. Photo by Kate Miller (PolarTREC 2016), Courtesy of ARCUS. This is a guest blog post by Sara Wilbur, edited by Paige Jarreau at LifeOmic. Sara is measuring telomere length for the first time in arctic ground squirrels for her Master’s thesis at the University of Alaska Fairbanks. 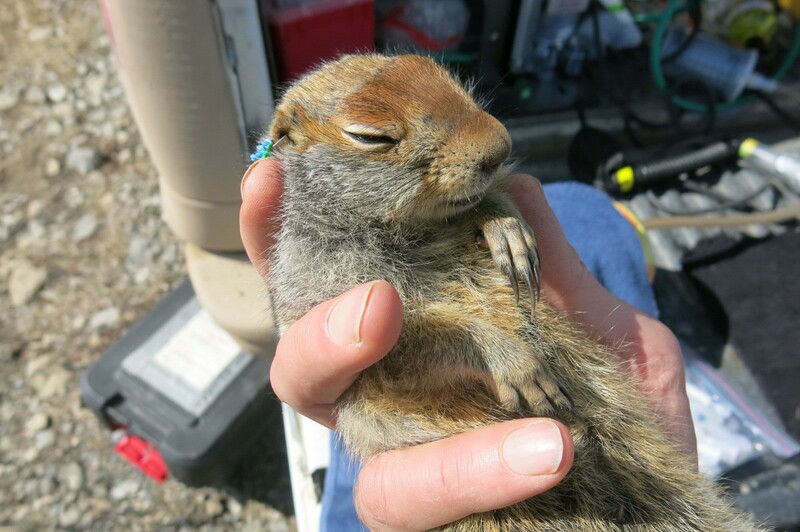 Last summer, Sara traveled with a team of researchers to the Toolik Field Station to capture 25 free-living arctic ground squirrels. The squirrels have been housed at the University of Alaska Fairbanks throughout their hibernation season, and they are revealing cues to how metabolism and telomere length (the protective DNA caps on the end of our chromosomes that shorten as we age) might be connected. These squirrels may have extra long telomeres, perhaps thanks to their long sleeps. Metabolism and cell turnover have been implicated in telomere shortening… hence the research interest in hibernators! Chromosome ends. Credit: Thomas Ried, NCI Center for Cancer Research, National Cancer Institute, National Institutes of Health. Look up, look outside. Every organism you can see, and many of the ones you cannot, are equipped with infinitesimally small “clocks” that track the age of each and every cell. These clocks are known as telomeres, which are repetitive DNA sequences that protect the ends of chromosomes — the structures that organize our genes — from degradation. You can think of them as the plastic or metal aglets that cover the ends of your shoelaces and protect them from fraying. If your chromosomes were shoelaces, the aglets would be the telomeres. Credit: Hesed Padilla-Nash and Thomas Ried, National Cancer Institute, National Institutes of Health. Across all eukaryotes, or organisms with a membrane-bound nucleus (from yeast to ground squirrels to humans), the telomere sequence is identical: TTAGGG, repeated thousands of times. As telomeres within a cell shorten over time due to normal cell division and metabolic stress, molecular pathways are activated that drive the cell to cease division — a state known as senescence — or to die. A buildup of senescent cells within an organism is linked with aging and many types of degenerative diseases. 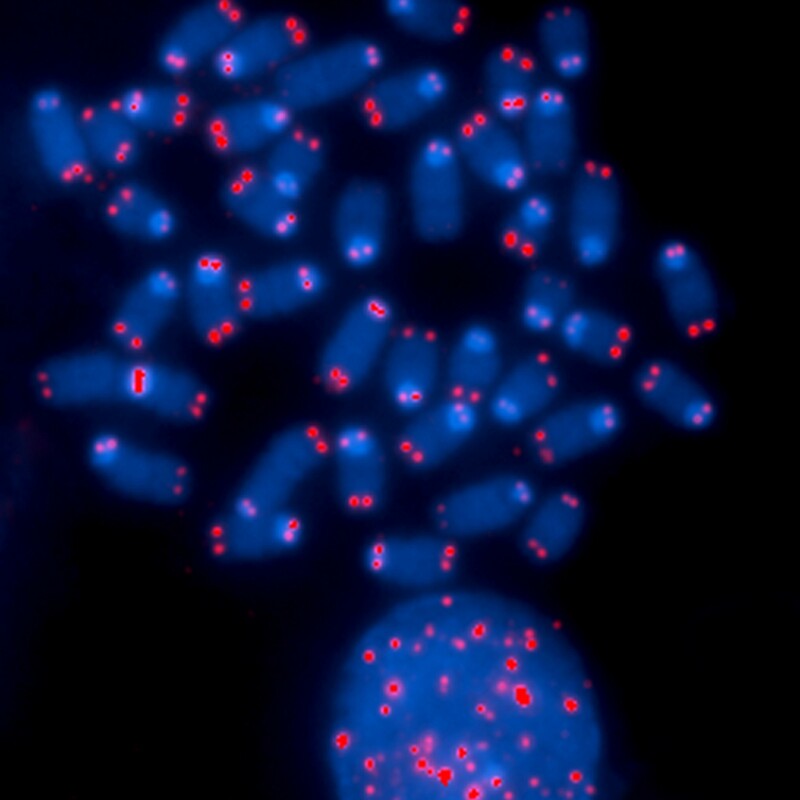 To keep telomeres intact in our stem cells and germ-line cells, an enzyme known as telomerase can be recruited to telomeres to replace lost nucleotides. Although useful in these progenitor cells, overactive telomerase in our somatic (body) cells poses a problem: 50–100% of tumors (depending on tissue) have detectable telomerase activity. Oddly enough, both short telomeres (which cause senescent cell build-up) and long telomeres (kept lengthy by inappropriate telomerase activity) are implicated in cancer development. Since their discovery in the late 1970s by Elizabeth Blackburn and Joseph Gall, telomeres have fascinated geneticists and, increasingly, the public. Researchers are curious about how telomere length changes over time, implications of degraded telomeres for cancer initiation and progression, and telomere length in the face of physiological challenges such as oxidative stress. Scientists and broader audiences alike are interested in how telomere length could predict longevity and how lifestyle might impact their integrity. Unfortunately, there doesn’t seem to be a simple, direct relationship between telomere length and how old an organism is. In general, telomeres do shorten with age in most taxa. However, telomere lengths of two age-matched individuals of the same species can be highly variable and differ across tissues based on genetics, varying cell division rates, level of telomere-specific DNA damage, or differences in how cells respond to telomere shortening. For instance, your father, at age 70, could have longer telomeres in some tissues than you, at age 30, depending on the factors listed above. Elucidating the mechanisms that affect telomere shortening, especially through in vivo studies on a broad range of model organisms, helps us understand this dynamic and complex process. Such work may one day illuminate a robust connection between telomere length and longevity. I am a graduate student at the University of Alaska Fairbanks. My work focuses on telomere length dynamics in the most extreme mammalian hibernator on Earth, the arctic ground squirrel (Urocitellus parryii). This animal hibernates and survives through sub-freezing temperatures for more than half of every year! Arctic Ground Squirrel. Credit: NPS Photo/Kent Miller. I found inspiration for my research at the 2016 International Hibernation Symposium in Las Vegas. Physiologist Thomas Ruf from the University of Veterinary Medicine in Vienna shared new research on telomere dynamics in a temperate hibernator, the edible dormouse (Glis glis). With DNA extracted from cheek cells at pre- and post-hibernation, the Viennese researchers found that telomere length decreased over one year and that this effect was best explained by number of arousals (in other words, the dormice that aroused more during hibernation had greater telomere shortening). Through a fortunate series of events, I was able to travel to Vienna in 2017 to work with Ruf and colleagues in developing my own assay for measuring telomere length in hibernating arctic ground squirrels. Hibernation is a state of prolonged dormancy, represented most famously by the bear. Ground squirrels are also exceptional hibernators, retreating to their burrows for 7–8 months out of the year and living off of only fat reserves. [Editor’s note: Kind of like you when you are fasting through the night! 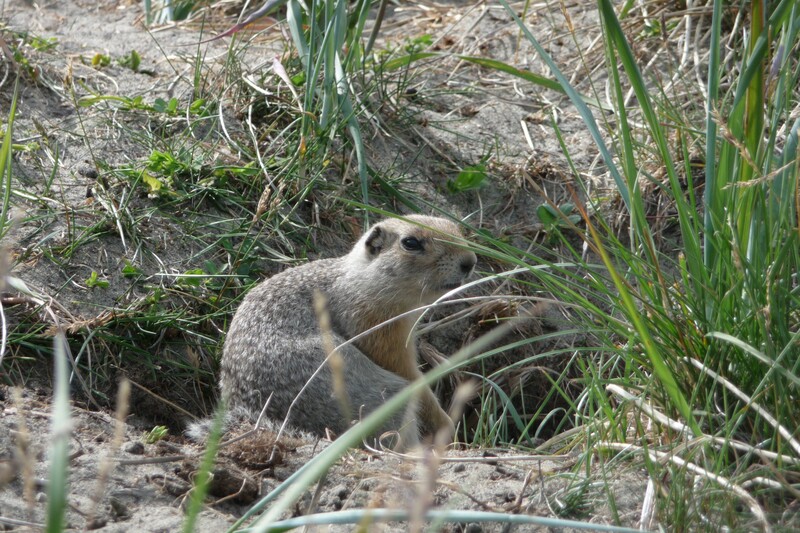 Only much more extreme…] Although outside appearances suggest that ground squirrels are completely inactive, their underlying physiology is remarkably dynamic. Hibernation in the arctic ground squirrel can be divided into two alternating phases: torpor, or a profoundly quiet metabolic state with very low heart rate and internal temperature, and arousal, a brief yet dramatic return to active-season-level metabolism. Arctic ground squirrels experience 12–15 arousals throughout each hibernation season yet spend the majority of their time at body temperatures as low as -2.9°C (26.8°F). 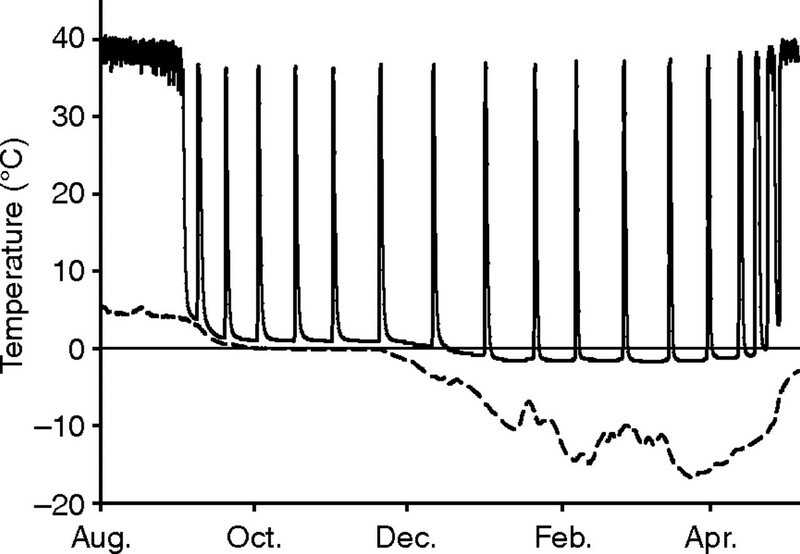 Arctic ground squirrel core body temperature (solid line) and nearby soil temperature (dashed line) over one winter near Toolik Lake in northern Alaska. Image credit: Cory Williams, University of Alaska Fairbanks. Arctic ground squirrels have large pockets of brown adipose tissue (BAT) stored around their heart and brainstem. When a squirrel begins to arouse (side note: no one is quite sure why hibernators periodically rewarm, or what triggers this. Current research at the University of Alaska Fairbanks is trying to uncover a piece of that mystery! ), it first warms through non-shivering thermogenesis, or internal heat production, which occurs in BAT. Mitochondria — the organelles that provide cellular energy in the form of adenosine triphosphate, or ATP — are found in abundance in BAT. Mitochondria in BAT go into overdrive during an arousal, producing heat in addition to ATP. Once the animal reaches a certain temperature it begins to shiver, creating even more internal heat. Finally, the animal reaches “normal” body temperature, stays there for a few hours, and then slowly lowers its metabolism and body temperature again to prepare for the next torpor bout. 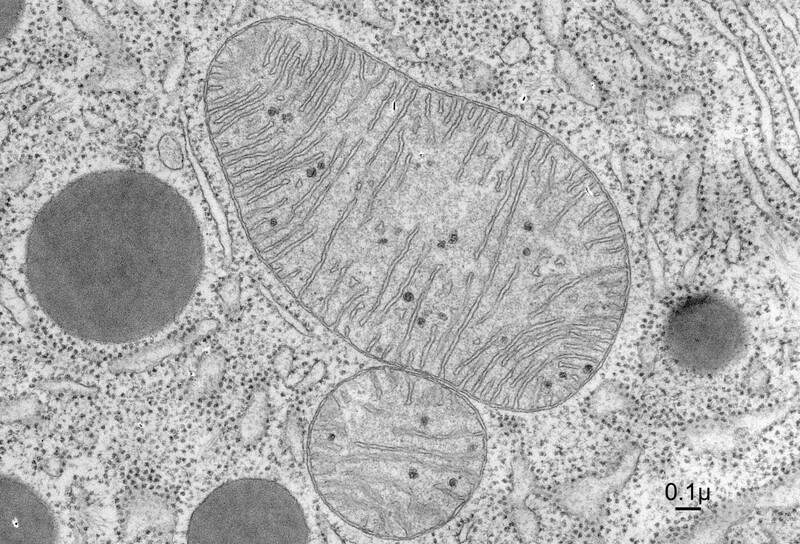 Electron micrograph of mitochondria from bat pancreas. Image credit: Keith R. Porter archives. 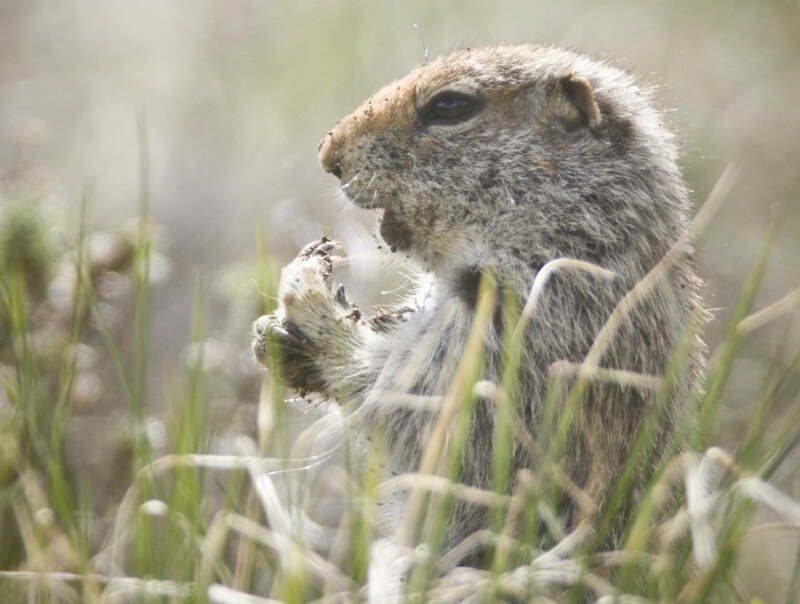 Through a process known as oxidative respiration, mitochondria in brown fat are responsible for the energy and heat required to bring an arctic ground squirrel out of torpor. However, oxidative respiration has its drawbacks. Highly unstable reactive oxygen molecules produced as a byproduct of oxidative respiration can interact with and degrade lipids, proteins and nucleic acids. Telomeres, which are located at the ends of our chromosomes and are rich in guanine (the nucleotide most susceptible to oxidation), are considered prime targets for oxidative damage via reactive oxygen species. Oxidation isn’t the only way that these terminal sequences can be degraded. Telomeres shorten by a few base pairs with each round of cell division due to an inherently incomplete DNA replication system. Over time and over many divisions, telomeres get shorter and shorter, eventually triggering cell senescence, or a permanent state of stalled cell division. 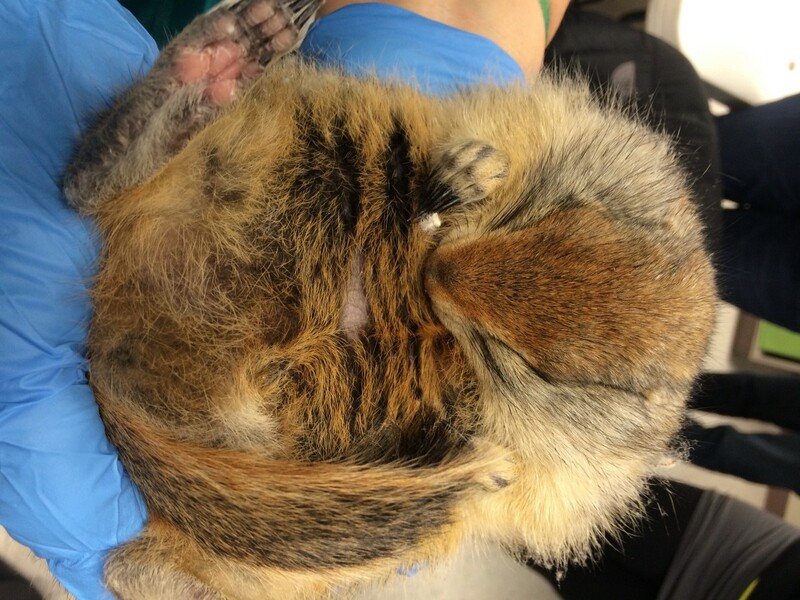 Studies show that hibernators like arctic ground squirrels experience large oxidative stress loads and higher rates of cell division during arousals. Both processes may especially impact tissues that fuel these rewarming events, such as BAT. If this is true, telomeres may shorten to a greater degree in BAT than other tissues not directly involved in arousals, and may not degrade as much in peripheral tissues not involved in rewarming. Such potential tissue-specific telomere shortening in a hibernator like the arctic ground squirrel presents a perfect natural system to study how telomeres change in vivo, rather than in a petri dish. To truly understand how telomere length changes at the individual level as we age, it is essential for researchers to quantify telomere length change on a per-tissue basis, as tissues in all organisms differ in their rates of cell division and may experience different levels of metabolic stress. Arctic Ground Squirrel. Credit: Bering Land Bridge National Preserve. What can hibernators tell us about humans? Although telomere research has exploded since the 1970s, the health applications of telomere length remain largely unresolved. 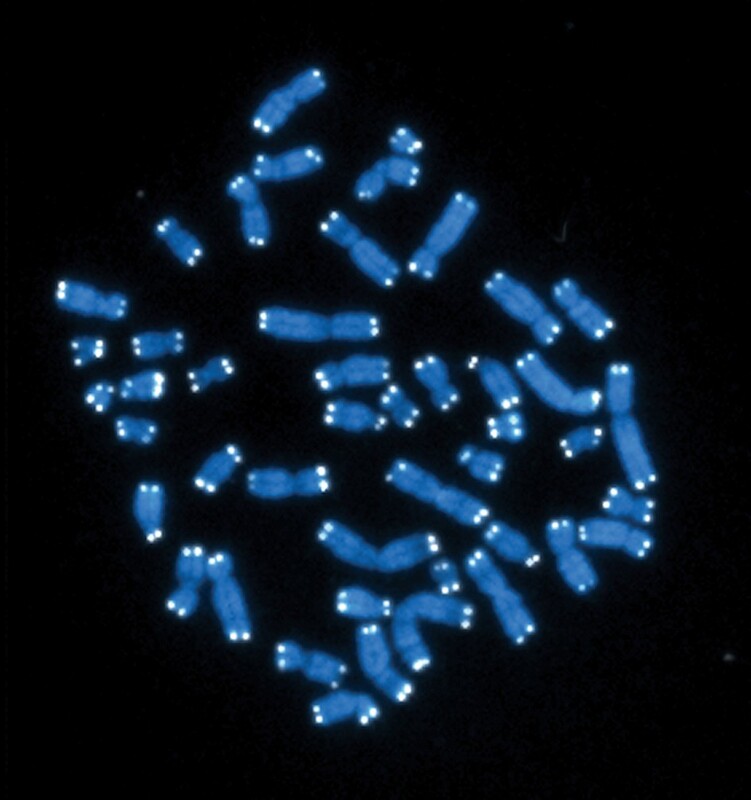 As much as we’d like to use telomere length as a simple biomarker for projected longevity, scientists are still debating the usefulness of telomere integrity in predicting how and how quickly humans age. Furthermore, although it’s been well established that oxidative stress impacts telomere length in vitro, in vivo studies are comparatively less conclusive. This is not to say that telomere length is a useless diagnostic tool, or that the oxidative stress-telomere shortening hypothesis falls flat. I believe that pursuing more in vivo studies over a wide range of organisms, instead of relying solely on cell cultures and on common laboratory animals, will provide a more nuanced, complete and interesting picture of how humans age and what telomeres can tell us about this process. 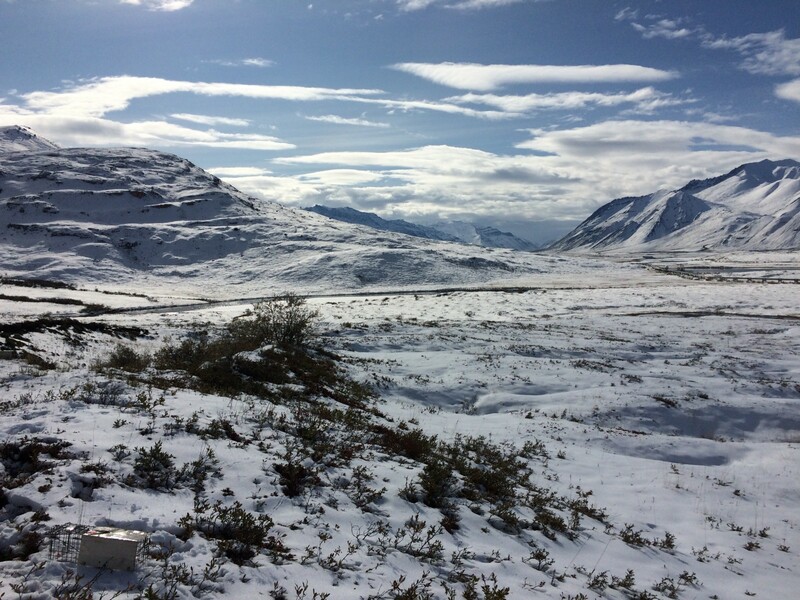 Trapping squirrels north of the Brooks Range in Arctic Alaska, September 2017. Photo credit: Sara Wilbur. To understand a complex problem, it’s good to start simple. Arctic ground squirrel hibernation physiology is dynamic yet tightly-regulated and predictable. As described above, arousals are initiated by BAT. Once rewarming begins, organs involved in processing metabolic by-products, like the liver, get to work. Heart beat increases and blood starts to pump more rapidly. Ultimately, the squirrel is as warm as when it’s scampering between burrows under the midnight sun. BAT, liver and heart are thus intimately involved in warming up the animal. Other tissues, such as the skin, do become warm by the end of an arousal but are not directly implicated in the arousal process. Quantifying telomere dynamics between different tissues can help researchers pinpoint how telomeres change according to the metabolic load experienced by the tissue they were extracted from. Humans, on the other hand, are wilder systems, and we do not have such scheduled fluctuations in our physiology. We are highly variable creatures, choosing to couch potato one day while training for our upcoming marathon the next. Even the most scheduled of our species is unlikely to maintain strict patterns of high metabolism and stasis for eight months straight as arctic ground squirrels do. These animals fit the bill for a living, breathing research model that also exhibits highly patterned physiology and tissue-specific oxidative stress for much of the year. Thus, determining telomere dynamics at the level of the tissue in a hibernating animal provides a useful foundation to answer questions concerning human telomere length, oxidative stress and longevity. 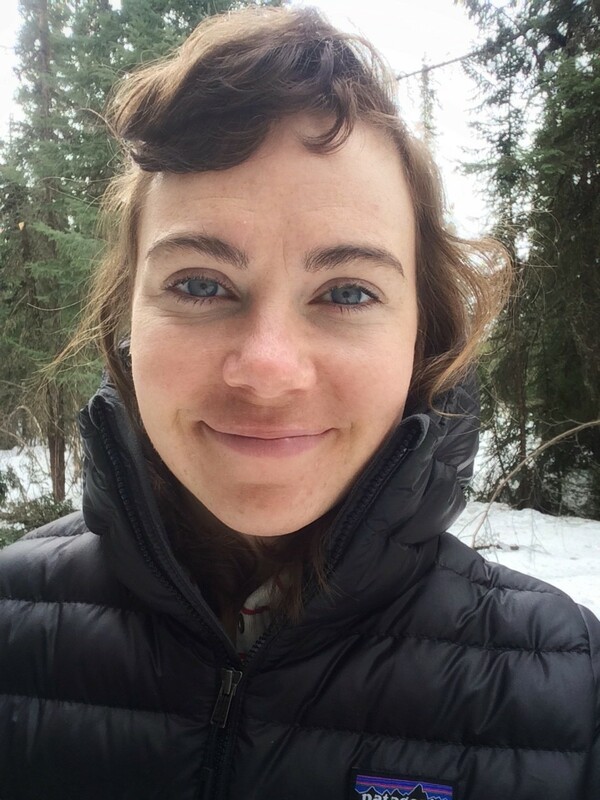 A bit more about me and my research: I returned to my hometown of Fairbanks, Alaska, in 2016 to immerse myself into the incredible world of arctic ground squirrel hibernation. Although my undergraduate research focused on photosynthesis and plant growth characteristics, I stepped into the world of animal physiology to answer some basic wonderings about the highly specialized and intricate ends of squirrel chromosomes. When I’m not pipetting or cleaning up squirrel poop on campus, you can find me trapping squirrels or cleaning up squirrel poop at the Toolik Field Station in far north Alaska. Still in the data collection phase (preliminary results suggest that arctic ground squirrel telomeres are quite long! ), I hope to analyze my results this summer and graduate in spring 2019. Learn more about metabolism and aging with the LIFE app.